At PDSA, saving, protecting and healing pets is what we’re all about. We are dedicated to improving pet wellbeing in three very special ways – by educating owners, preventing disease and carrying out life-saving operations. Pets are part of the family. Our four-legged friends give unconditional love and are sometimes a person’s only companion. They don’t deserve to suffer through economic and social hardship. They can’t help themselves. But we can – with your help. We are the UK’s leading vet charity. Every year, the dedicated teams at our 48 Pet Hospitals work tirelessly to provide 2.7 million veterinary treatments – including 440,000 preventative treatments. This helps over 470,000 much-loved pets and brings peace of mind to 300,000 owners. And we are a leading authority on all things concerning pet health and wellbeing: whether its leading the debate on pet obesity, conducting Britain’s biggest annual pet wellbeing survey, raising the status of animals or simply celebrating their contribution to our lives. This is all down to our fantastic people: our devoted vets, nurses, charity shop workers, fundraisers, volunteers and support staff. And it’s thanks to your help that we can keep so many pets healthy and happy. 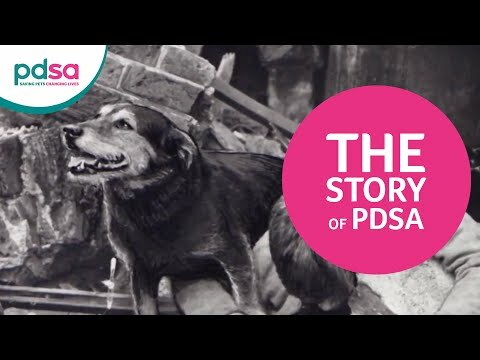 PDSA has been a lifeline for sick and injured pets since 1917. In that time we’ve provided a staggering 100 million free treatments to more than 20 million pets. Our veterinary expertise and comprehensive education programme means that we touch the lives of more pets and owners than any other animal welfare organisation. And we owe it all to one truly inspirational woman: PDSA’s founder, Maria Dickin. Maria Dickin was born in London in 1870. The daughter of a Free Church Minister, she was an independent-minded young woman, never afraid to voice her beliefs. When she went to visit the the poor in the East End of London, she was horrified by the terrible poverty she witnessed – especially the sight of their sick and injured pets who were in desperate need of veterinary care. Dogs and cats had no choice but to scavenge from the gutters, many in pain and suffering – raw with mange and often dragging their broken limbs. All because their owners simply couldn’t afford to pay for treatment. So on Saturday 17 November 1917, during the First World War, Maria opened The People’s Dispensary for Sick Animals of the Poor, providing a free service for pets in need, in a Whitechapel basement. There was so much demand that she soon needed larger premises and established a fleet of mobile dispensaries to travel around the country. Maria devoted her life to improving the welfare of the pets she loved. Her determination, enthusiasm and pioneering spirit define PDSA to this day. We’re proud to continue her work, ensuring that today, and in the years to come, people who, through no fault of their own, can’t afford to pay for veterinary care for their beloved pets still have somewhere to go for help and free treatment. Head and Heart – Expertise with understanding. At PDSA, we combine expertise with understanding to help deliver a happier and healthier future for pets and their owners. Better together - Empowering through unity. We can achieve more if we work in partnership with everyone who touches the life of a pet. Working together, PDSA, owners, supporters and the public can all have a positive impact on pets’ health and happiness. Passion with Purpose – Driven in our dedication. We can all make a difference in creating a world where no pet suffers. We must improve and deliver more today than yesterday, making every pound deliver even more benefit. Our passion and dedication drive us to continually achieve more. We support 300,000 pet owners throughout the UK. We help the pets of owners in need. To be eligible for our free veterinary service, owners must be in receipt of means-tested help with council tax (Council Tax Support / Reduction) and live within the catchment area of a PDSA Pet Hospital. To be eligible for our reduced cost veterinary service, owners must live within the catchment area of a PDSA Pet Hospital and be in receipt of means-tested benefits (including Working Tax Credit, Child Tax Credit, JSA, ESA and PIP) or be pensioners living in houses Council Tax bands A-D.
We’d love to help everyone, but as a charity our funds are limited, so you do have to be eligible for your pet to receive PDSA treatment. Our website contains lots of information for keeping your pet healthy and happy. All of our PDSA Pet Hospitals provide professional care from highly qualified vets and nurses, plus dedicated support staff, like the receptionists you see when you arrive. We can help all the most popular types of pet – dogs, cats, budgies, rabbits and other ‘small furries’ like guinea pigs, hamsters and even chinchillas. Sorry, but we don’t cover insects, reptiles or farm animals, so you’ll need to take them to a specialist vet instead.